The military has been supplying numerous photos and some videos of their firefighting activities on the Black Forest Fire. Helicopters from the Colorado National Guard and Fort Carson as well as C-130 MAFFS air tankers are assisting firefighters on the ground. Here are seven photos of aircraft taken on June 12 by military personnel. The DC-10 is not military, but is working under a contract with the U. S. Forest Service. PH, I watched live coverage of the Black Forest Fire for a couple of hours late this afternoon, and only saw Tankers 911 (DC-10) and Tanker 48 (P2V), plus a lead plane or air attack. With only 10 large air tankers for the whole United States, it’s a wonder we see any. Thank you for posting important info about the fires in Colorado. My son lives in Colorado Springs east of highway 83 (Black Forest wildfire) and every day of this fire threat is hard to get through. The most helpful info of any source I’ve seen is your arial map of heat/radiation. It’s not on your sight right now but please continue to show it . Your site is by far the most helpful. It’s a Google Earth map. zoom in on the Colorado area. 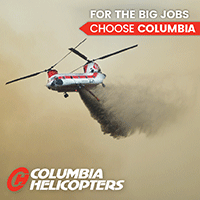 Do you have a list of civilian companies that are flying in support of the Black Forest Fire? I remember during Waldo I could never get a straight answer. I know 10 Tanker operates the DC-10, but who works the other civ carriers? I saw Minden Air Corp’s Tanker 48, a P2V, dropping on the Black Forest fire today. There are eight helicopters working on the fire, most of them are military. HERE is a partial list of the large air tankers on contract, but it is not up to date. I gave you a “straight answer”, by the way, whatever that is exactly. I haven’t seen Neptune here (at least, not personally). It’s so easy to salute the 4th ID and 302 ARW guys, the civs are the unsung heroes that never get any credit. So many great helo drivers did their best during Waldo and BFF…and I have no clue who is driving the prop civ tankers. I’ve tweeted local news and no one seems to know, their focus is on the military resources. Neptune Tanker 45 was the first tanker to drop on the fire tues. Also that night Tanker 911. Minden’s Tanker 48 Showed up Weds. along with two Maffs. Tanker 44 in PUB along with 911. All worked the fire Thurs.